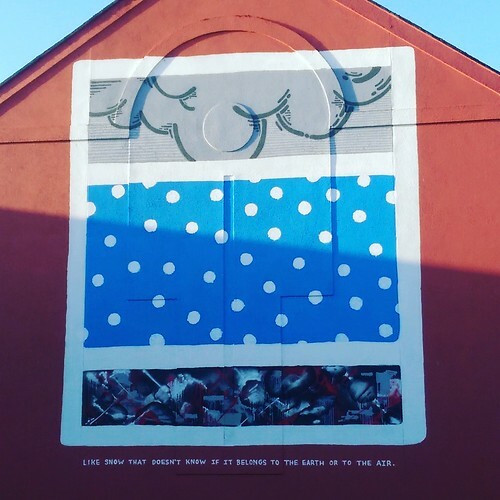 Walking around Galway you might notice a series of plaques at various strategic locations, each of which has a poem inscribed on it, usually with a theme relating to the city. 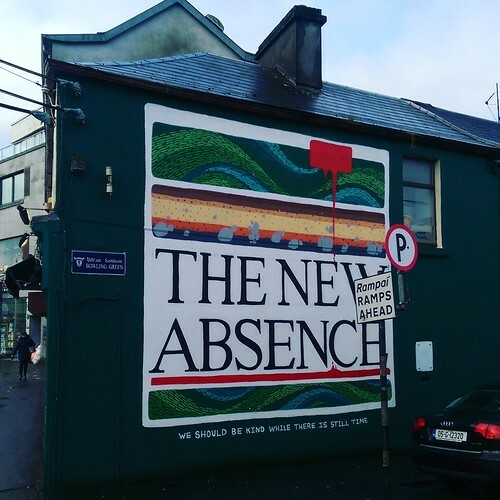 Together they comprise the Galway Poetry Trail which has been created in conjunction with the the Cúirt International Festival of Literature, an annual literature festival that’s been held in Galway since 1985. During my latest visit I tried to find some time to visit some of the plaques. A number of the poems are by well known authors, including Seamus Heaney, James Joyce and W B Yeats, but others are by poets I didn’t know, so following the trail introduced me to their work. Here’s a few of them. 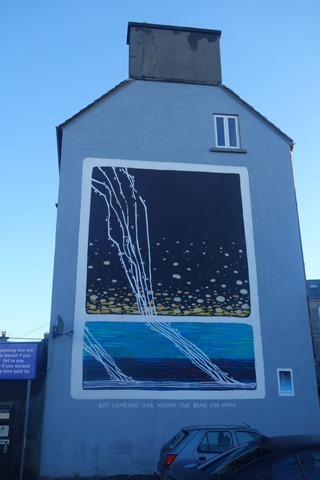 This one, featuring the poem Bright City by Moya Cannon is on the bridge overlooking the harbour and the Cladagh, to which it refers. across the road and on to the Claddagh. even the cars on the Long Walk are transfigured. 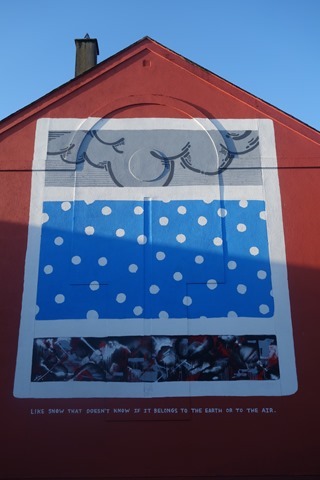 While I was wandering around the centre of Galway, I spotted this mural painted on the side of a butcher’s shop opposite the St Nicholas Collegiate Church. two of them facing each other on walls flanking a car park. I was curious. They clearly had some connection with each other, but what? And the words painted as part of the murals clearly had some meaning. But there didn’t seem to be any information about them. On returning home, some research on the web finally revealed the answer. 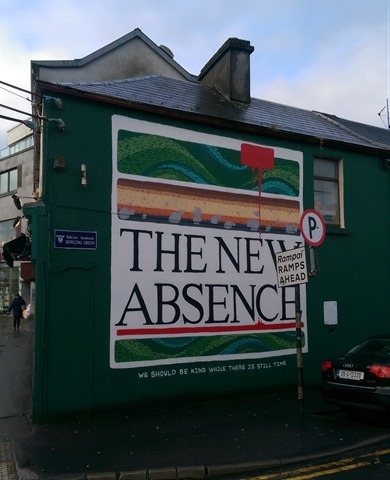 They had been created last year as part of the annual Cúirt literary festival. 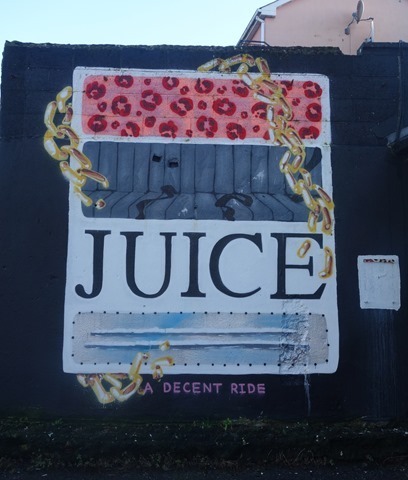 The paintings are an interpretation of poems by Philip Larkin, Dermot Healy, Nikola Madzirov and Irvine Welsh by local street artist Finbar247. Originally, there were plaques with the poems installed on the walls next to the poems but, with the exception of one, they had been removed, presumably by vandals. There are some videos showing the paintings being created by the artist on the Cúirt website. This exhibit in the Imperial War Museum North looks like an abstract sculpture. 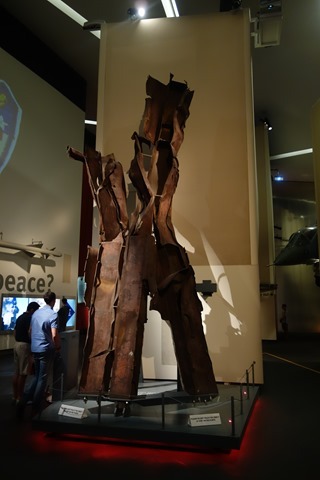 But closer inspection reveals that it’s a fragment from the Twin Towers. The columns, thought to be from the North Tower, formed part of a window section from an external wall. nothing stands but free sky, unlimited and sheer. by wind, dabbed at and eased by rain, exposing the wound. shout into tangled holes. What answers back is aftershock. All land lines are down. are false. One half-excoriated Apple Mac still quotes the Dow Jones. with faces of the disappeared. As if they might walk from the ruins – chosen, spared. arcing through blue morning, like a curved thought. of a passenger plane beading an office-block. yet moving headlong forwards, locked on a collision course. before the furious contact wherein earth and heaven fused. Armitage’s poem is inspired by, and mimics, one with the same title by Thomas Hardy, written in response to another disaster which gripped the world – the sinking of the Titanic.